Through Denny, Enzo has gained tremendous insight into the human condition, and he sees that life, like racing, isn’t simply about going fast. Using the techniques needed on the race track, one can successfully navigate all of life’s ordeals. On the eve of his death, Enzo takes stock of his life, recalling all that he and his family have been through: the sacrifices Denny has made to succeed professionally; the unexpected loss of Eve, Denny’s wife; the three-year battle over their daughter, ZoË, whose maternal grandparents pulled every string to gain custody. In the end, despite what he sees as his own limitations, Enzo comes through heroically to preserve the Swift family, holding in his heart the dream that Denny will become a racing champion with ZoË at his side. Having learned what it takes to be a compassionate and successful person, the wise canine can barely wait until his next lifetime, when he is sure he will return as a man. 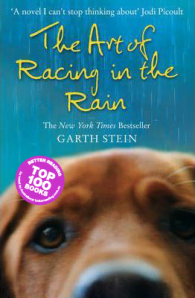 Garth Stein is the author of How Evan Broke His Head and Other Secrets, which won a 2006 Pacific Northwest Booksellers Association Book Award, and Raven Stole the Moon. He has also written a full-length play, Brother Jones, which was described as "brimming with intensity" by the L.A. Weekly. Garth worked as a documentary filmmaker for eight years, and directed, produced or co-produced several award winning films. After spending his childhood in Seattle and then living in New York City for eighteen years, Garth returned to Seattle, where he currently lives with his family and their dog, Comet.